I had my first gazpacho shooter, an hors d’ouevre version of the chilled soup served in a shot glass, around 1990, at some or another event soon after I moved to New York. It seemed so cute, so innovative. And for years afterward, shot glasses of chilled pea-tarragon soup, “adult” milkshakes and shrimp cocktail were passed on silver trays by waiters across the city. 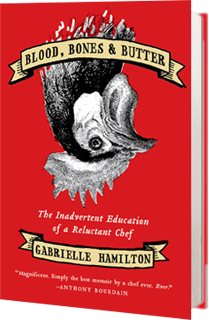 At that very same moment, Gabrielle Hamilton was logging time at catering companies with factory style kitchens located among the warehouses of New York’s West Side—huge, faceless, grind-it-out places responsible, I now know, for the same foods that turn up at catered events everywhere, from weddings to galas at the New York Botanical Garden and Museum of Natural History. I’ve had all the trendy items she mentions: the tidbits served in a Chinese soup spoon; the chocolate mousse/custard/brulée served in an espresso cup; the bruschetta topped with Tuscan white beans or Sicilian tuna salad; the filets of salmon, salmon, salmon. Little of it has been enjoyable, and thanks to Hamilton’s memoir, I have an even better understanding of why. In those windowless kitchens, dozens of chefs with not much experience work long-haul shifts prepping food for six to ten jobs simultaneously in the peak seasons. That bruschetta, blast toasted on trays and sprayed with a cheap blended olive oil, could sit for days before being portioned off for a job, wrapped up and shipped out. And for every bride-to-be carefully going out on menu tastings, Hamilton lays waste to the idea of carefully selected wedding food. When the intended couple had agreed on this menu, back in January, after a private tasting in the little nicely dressed and furnished showroom of the catering company, it had been prepared for them by the chef of the company, in just enough quantity for the tasting—not more than four portions of each thing—and each ingredient had been hand-selected by the chef and prepared the same day as it was eaten. In fact, it went from stove to table during the tasting and it, indeed, looked and tasted very good. . . But by the time the bride and groom, now betrothed, and their three hundred guests were enjoying this same meal on a beautiful June evening, we were now on a very different scale of production. Will you be having the chicken, or the salmon? Next Post Blood, Bones & Butter: Alla Famiglia! Ha! I choked on those lines, recalling our own lovely pre-wedding tasting, the chef (or someone playing one for our sake) explaining the items with a joke here, a serious note there. The reality that was delivered to the venue a month later was not awful, but compared to what crossed our lips in that private dining room for two, the glamor was definitely dented. I ended up wishing I had just cooked for our guests myself. I was out of my league. Live and learn. Remember the mashed-potato parfaits in martini glasses, circa 1995? I used to think, what a great scam. The guest got to top a scoop of cheap, filling, uninteresting potatoes with salsa or cheap cheese or chopped onion… And they LIKED it! Evil genius. Meanwhile, I will never eat toasted bruschetta at a reception again.